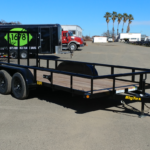 One of our most popular utility trailers. The 35SA is used to haul motorsports vehicles, lawn & garden tools, make dump runs, or for just about anything you can think of. Model 35SA comes standard with a 3,500lb. Dexter EZ-Lube axle and 15″ tires and wheels. The top rail is a 2″ diameter steel tube that sits about 12″ above the trailer deck. It comes with a 4ft tall rear ramp gate that is made from 2″ square tubing. There are four tie down loops welded on the inside of the frame angle iron for tying down your cargo. 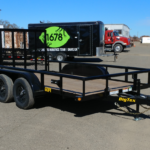 When it comes to small utility trailers, it’s tough to beat a Big Tex 35SA. It’s a well built, super-tough trailer and it’s available in lengths from 8ft to 14ft. This 10 footer would be perfect to haul a small side-by-side, a full size ATV, or several motorcycles. Payload capacity is 2,007 lbs.